Looking for a meatless dinner idea that doesn’t leave you hungry? 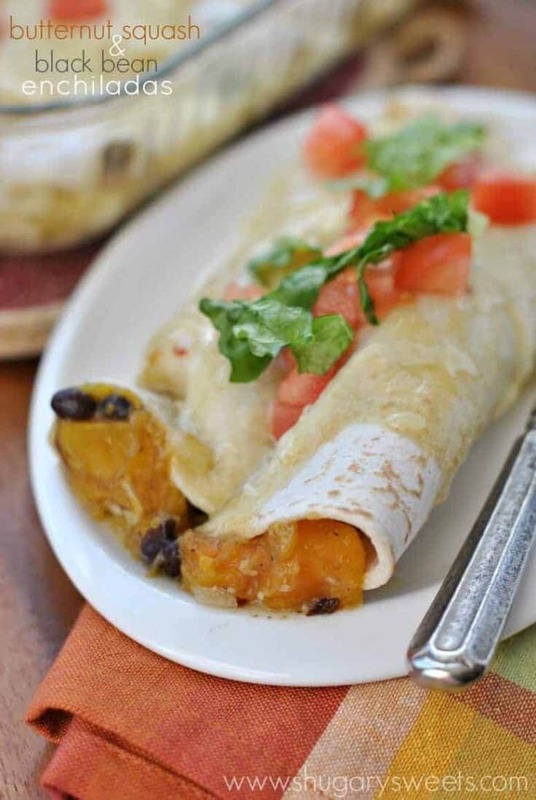 These Butternut Squash and Black Bean Enchiladas are your answer for a delicious, filling weeknight dinner idea! Several years ago I went to a women’s retreat and one of the husband’s delivered a dinner to us. When I heard it was vegetarian enchiladas, I’ll be honest, my heart sunk a little. I love meat. I really do. Dinner doesn’t feel complete without some sort of meat. But, I also love eating healthy. So while we try to only eat red meat once a week, we do eat a lot of chicken. After one bite of those vegetarian enchiladas I was smitten. I was in love. I was head over heels in love. Of course, like any foolish girl in love, I don’t remember why I was in love, but I remember BEING in love. 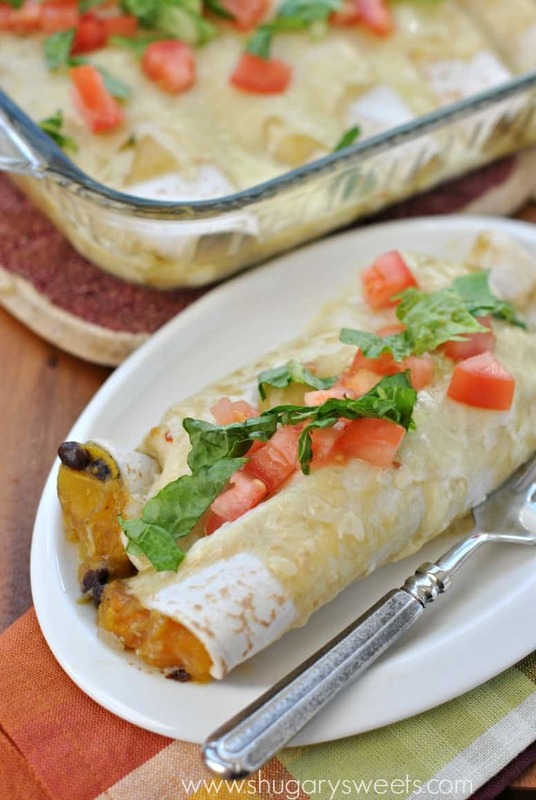 The idea of making meat free enchiladas has been in the back of my mind for some time. Then my husband came home from Costco with a container of cubed and peeled butternut squash. Enchiladas immediately came to mind! YOU GUYS. I could have seriously eaten the entire pan by myself. These were so amazing, I don’t even know what to say. I roasted the squash to get it soft and caramelized. Best decision ever. Depending on the season, you can really add any of your favorite veggies here. Zucchini would have been tasty, as would sweet potatoes. 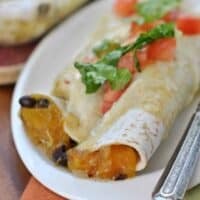 But of course, I’m a bit partial to the butternut squash and black bean combo! It was so comforting, and I honestly did not miss eating meat in this dish. 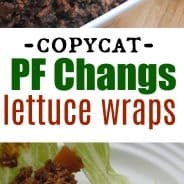 So if you’re looking to try some meatless Monday meals…or if it’s Lent and you want to make a meatless Friday dish. 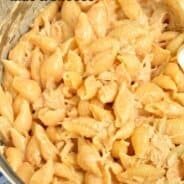 Or if you’re just looking for comfort food, make this dinner. You’re welcome. In a large bowl, mix squash with olive oil, salt, pepper, garlic and onion. Pour onto a large baking sheet and roast in a 450 degree oven for about 20 minutes, turning halfway through. Return roasted veggies to a large bowl and combine with black beans and cumin. In a 13x9 baking dish, pour 1/4 cup enchilada sauce in bottom of pan to keep tortillas from sticking. Fill each tortilla with squash mixture and place in baking dish. Repeat until all filling is used and tortillas are lined up in dish. Pour remaining sauce over top of tortillas and top with shredded cheese. Cover and bake in a 350 degree oven for 30 minutes. Remove foil and bake an additional 10 minutes to melt cheese. 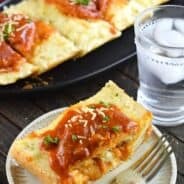 LOVE Enchiladas? I’ve got a few ideas for you…. 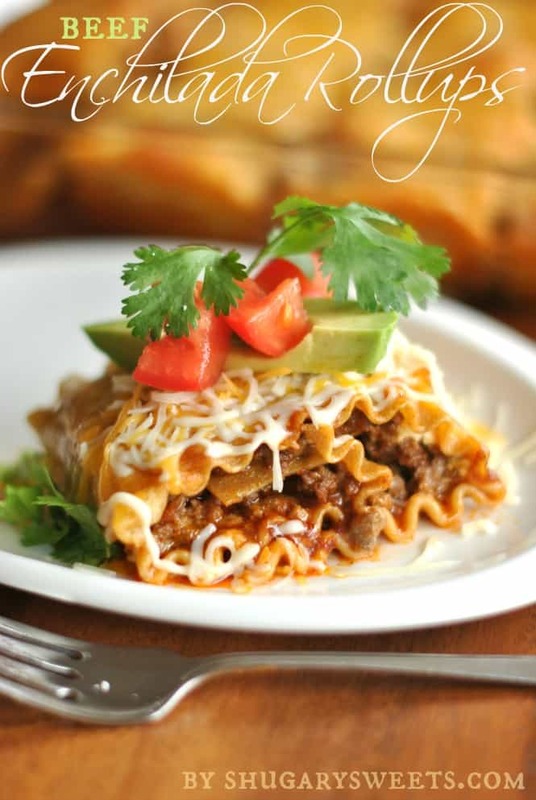 Beef Enchilada Roll ups….pasta meets enchiladas in this delicious family dinner! 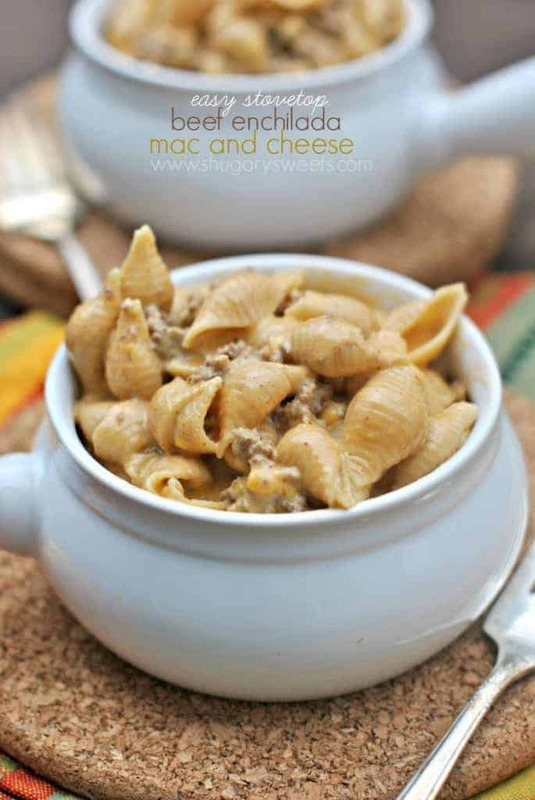 Beef Enchilada Mac and Cheese… cheesy macaroni with beef and enchilada flavor! Yum! Yes, leftovers for breakfast would be perfect 🙂 Thanks for pinning!! 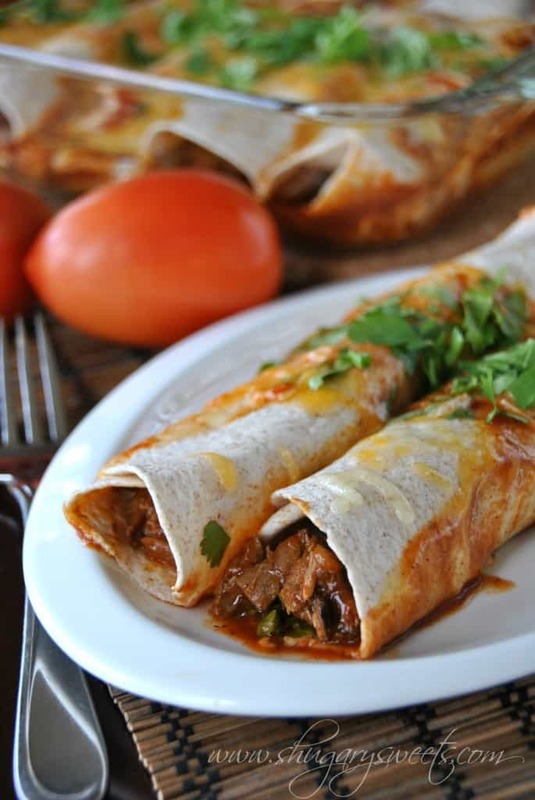 These enchiladas are serious works of art! The butternut squash addition is so brilliant! Thanks Jocelyn. Maybe not works of art, but definitely delicious! I’m always afraid I’ll be hungry after a meatless meal … although beans have converted me! The squash is a great addition! We gave up red meat for lent…I miss it! But I am loving all of the dishes I have been trying to make without it! This would be perfect for us! I love that they’re vegetarian and that even though you’re totally not a vegetarian, that you can totally get behind this. Awesome. Pinned! This sounds so good. I have never heard of the combo of black beans and squash. This is on my bucket list of things to try now. I am definitely very intrigued by these enchiladas. The roasted caramelized butternut squash has my attention for sure!!! Indeed!! Mouthwatering is the perfect word. I seriously could not stop eating!! Veggies can really be just as good (or better!) than meat! This looks amazing!! 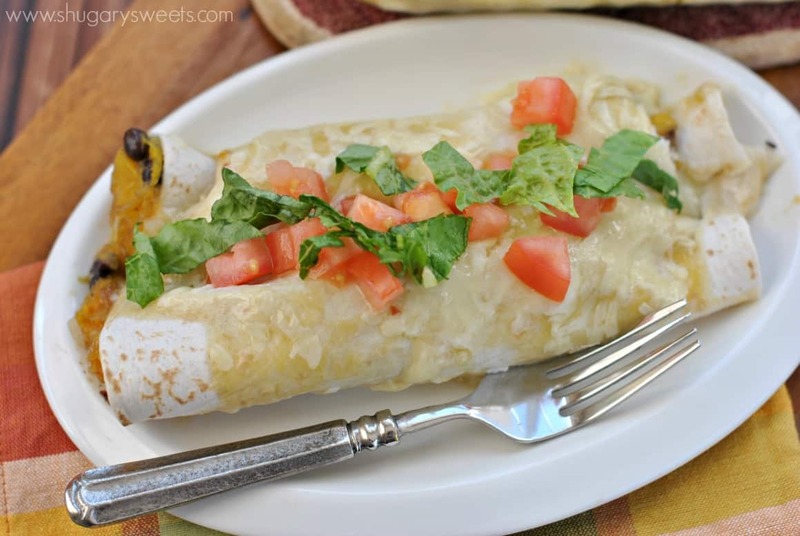 I love butternut squash – such a great idea to put it in an enchilada! Thanks Cate. So very true!!! I just bought that exact pkg of squash from costco and was trying to decide what to do with it! So excited to make these! Oh Kari, I hope you make this!!! I REALLY loved it!